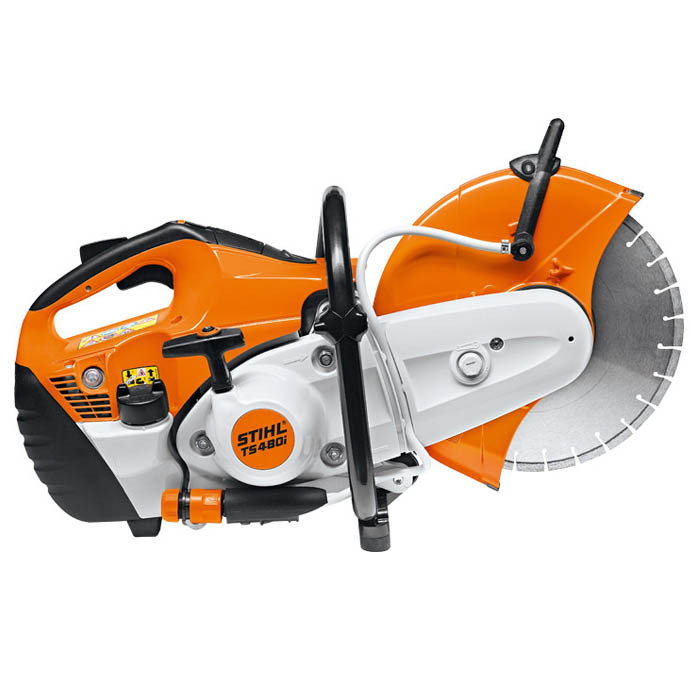 Unique STIHL Injection engine technology for 300 mm cutting wheels. Easy to start; powerful torque. Fully-equipped with long-life air filter system and electronic water control. Can be operated by hand or with the FW 20 cart. Supplied with abrasive cutting wheel. STIHL Fuel injection (i) - The electronically controlled fuel injection ensures perfect running properties every time and reduces fuel consumption in comparison with tools without injection technology. STIHL ElastoStart - STIHL ElastoStart reduces the shock caused by the compression of the engine during starting. The compression shock is taken away from the user's joints and muscles through a spring or rubber element in the starter handle. STIHL Electronic water control (A) - The electronic water control system can be operated via simple buttons while the engine is running. The water then switches on and off during cutting automatially, depending on engine speed. The water volume can be regulated by simply pressing the plus / minus buttons, ensuring optimum dust suppression at the touch of a button. Magnesium guard - The cutting wheel guard made from die-cast magnesium is particularly light. The guard and water attachment feature a particularly ergonomic design.